Sanitary landfills store solid waste while it decomposes, meanwhile protecting the groundwater supply underneath. Frequent covering of each new layer of trash also is intended to keep garbage from flying around polluting the air and to minimize the attraction of birds and rodents, which may spread disease. This is the typical destination of your garbage in the U.S. and other places also. While some people use the word interchangeably with "dump," it's important to note that a landfill has been engineered to provide some level of protection for both the groundwater and air aspects of the environment and isn't left open like a dump. Sanitary landfills also are not the same as a transfer station, which is a temporary holding place for solid waste on the way to its ultimate destination. Remember that sanitary landfills are quite a step forward from a dump, and if a landfill is the only solution that seems feasible for your community, it's far better than allowing trash to accumulate outdoors without any cover or anything underneath it. Clean-up of informal dumping grounds should continue, even after you have a landfill. If you use the link in the previous sentence, you can tell us about your experience with trying to do just that. Regulations typically require a solid impermeable (leakproof) liner made of perhaps multiple layers of thick plastic, very dense clay, and/or some strategically placed rock, all of which aims at keeping the groundwater safe. Without getting into too much of a yuk factor, rotting garbage produces some liquid that could "leach" its way out (soak through) the landfill, and the so-called "leachate" would be what would pollute the water supply. This is why landfills include a pipe system to collect this liquid, as well as rain that may fall before covering the previous day's deposits can be completed. On the air pollution front, governments usually require covering up the garbage with clean fill, dirt, or foam. Arrange a visit for your group to the local landfill, though, and you'll see up close and personal that these measures aren't completely effective. So on a day-to-day basis, solid waste is spread around the landfill in a designated area known as the daily cell. Sometimes cells are denoted with trenches, and at other times you'll see ramps that equipment operators climb to find the next day's place of deposit. Each daily cell then needs to be compacted as much as possible, both to try to defeat animal interference and to speed decomposition. A landfill typically remains open about 15 or 20 years. Obviously the degree of recycling and the character of the solid waste stream in that particular community can impact this figure. Most landfills are characterized as dry landfills, meaning that the garbage is separated from the outside air, both to please the neighbors through less odor and to try to keep the wildlife at bay. However, there are also experiments with wet landfills, which allow air to infiltrate and also recirculate the leachate within the mound of debris and fill to try to hurry along the breakdown of trash into smaller particles. In the United States, the Environmental Protection Agency (EPA) sets minimum standards for sanitary landfills, although each state is free to make tougher regulations. One requirement is for monitoring wells to be dug at certain distances from the cells, which allow the degree of groundwater pollution and the direction of the flow of any escaping leachate to be checked. Other countries may have far different regulations. European standards often are very strict. You can use your common sense to tell you that residential areas aren't going to be very happy to have a landfill near them. They wouldn't want the smell, the truck traffic, the social stigma, noise from traffic and compaction, or the fear of the unknown about what might eventually reach the air they breathe or the water they drink. So if not near residents, where? Occasionally the answer is easy, because of a closed mine, a natural valley, or an out of the way place or awkwardly shaped parcel near the community. But many times the landfill location is somewhat arbitrary--near enough to good transportation that will support the truck traffic (or occasionally rail), but far enough from neighbors who will object. Geology plays an important role too, as some areas will be much more conducive to protecting the water supply than others. Clay soils or solid rock reduce the expense of building the facility. Needless to say, a river or creek bank isn't a good place, even though it may be out of the way. An earthquake zone? I don't think so. Wetlands, floodplains, and high-quality wildlife habitat should be avoided, as these play important roles in our natural systems. Birds like landfills for some reason, so keep sanitary landfills away from airports. Perhaps the best option would be an aggressive waste reduction campaign. At least if the strategy is only partially successful, you will have delayed the time when the community needs to undergo the trauma of finding a new location and helping to bear the expense of a new facility. Although the concept of zero waste is appealing, it's too idealistic at this time. Let's talk about what we can really do. Mandatory recycling programs can decrease the volume of waste placed in the landfill. A dramatic increase in electronics recycling or e-waste recycling is still possible in many locales. Hazardous waste disposal (paint, chemicals, light bulbs, batteries, and the like) is still a hassle in many U.S. communities; you could change that. Construction material recycling may be out of sight and out of mind for most residents, but it's surprisingly important in terms of the volume of solid waste. Residents could do much thorough about composting food, coffee grounds, and yard waste. Plastic compost containers, some of which have a crank making it easy to turn over the contents, are neighbor-friendly. Certainly the manufacture of items with an eye toward their ultimate harmless decomposition will be a step in the right direction. So yes, let's reduce, re-use, recycle, and refrain from over-consumption, but zero waste isn't going to be the real condition in your community for many years to come. Incineration, which means controlled burning of garbage in a container that captures the gasses, solids, and ashes for further re-processing, has been a reasonable answer to solid waste for many years and is popular in some parts of Europe. However, no single incinerator technology is flawless, and all systems still have some residue that requires further consideration. So sanitary landfills will be part of urban and rural living for many folks in the world. Making them the best they can be is the challenge. At the end of their useful life and after the landfill has been officially closed according to demanding national regulations, sometimes they just sit around. However, the smarter communities may renovate them as parks, golf courses, or even wildlife sanctuaries. Re-use requires a very dense clay cap and making sure that the trench and piping system at the base capture rainwater. However, planting on top is both possible and desirable, given the right precautions. Construction atop old sanitary landfills is possible, and an office park in California proves the point. But the necessary extraction of methane gas, lest our pretty new office park explode, is a fairly costly deterrent to real estate development. While "mining" closed landfills is often discussed, we lack agreement on the best practices from both an economic and an environmental standpoint. 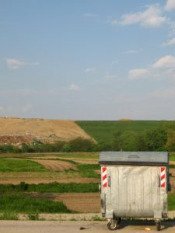 Because of their height, old landfills may be ideal locations for solar arrays. A solar array is a group of solar collectors. Typically the landfill has been placed near good transportation, which also is important to the utility company, and zoning may already be appropriate for utility usage. To be feasible, the closed landfill would need to be near a three-phase part of the electric grid. Speaking of energy, the methane gas generated by the landfill could be harvested. Pipes are inserted vertically into the landfill pit. Sometimes this occurs during operation, and the operator either may capture the methane or burn it off, which is why you sometimes see portions of landfills on fire. We suggest the passive park or wildlife habitat area with native plantings as one of the best lower-cost re-uses of a landfill. If your demand for land or energy is robust, start thinking bigger. It's certainly possible to place commercial buildings over a landfill, but it would be prohibitively expensive for most real estate markets.